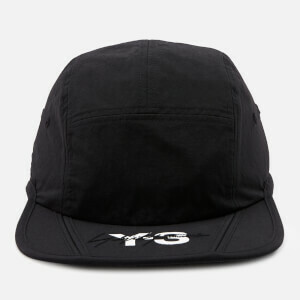 Black baseball cap by Y-3, Adidas’ collaboration with Japanese designer Yohji Yamamoto. Crafted in a light, breathable fabric, the hat showcases all the classic design features with its six-panel construction, domed crown and curved peak. A Velcro hook-and-loop closure to the reverse ensures a snug fit. Complete with tone-on-tone logo embroidery on the front.